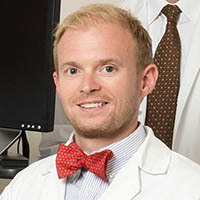 Dr. Andrew James Tompkins is a Clinical Instructor in Surgery (Urology) at the Brown University Warren Alpert School of Medicine and serves as the Female Pelvic Medicine and Reconstructive Surgery fellowship site director. In addition to teaching fellows he also is actively involved in resident and medical student urology education. He is active in clinical research with more than 12 peer-reviewed publications. Dr. Tompkins has completed a five-year residency in Surgery and Urology at Brown University’s Alpert School of Medicine where was nominated and elected for full membership into Sigma Xi scientific honor society. He is Board Certified and a Diplomate of the American Board of Urology. Following undergraduate training at Cornell University he earned his MD at the University of Rochester School of Medicine and Dentistry, graduating with honors and elected to the prestigious Alpha Omega Alpha medical honors society. In addition to general urology, he performs high-volume robotic surgery for prostate and kidney tumors, and performs minimally invasive kidney stone procedures.